Honored guests such as the United States ambassador to Switzerland and a Swiss Supreme Court justice attended a special event in Winterthur last Friday. The program was packed with high-profile speakers covering subjects from various fields of law. Every year, the New York City Bar Association (NYSBA) holds a European Conference. The SML is proud to have brought the Conference to Switzerland for the first time. The distinguished guests were greeted by Professor Jean-Marc Piveteau, President of ZHAW. He briefly introduced the University with some facts and figures emphasizing the importance of an international orientation and outlook: “Our business is knowledge, and knowledge knows no borders,” he said. Hans-Ruedi Grob, President of the Zurich Bar Association introduced his organization and its tasks. It was founded in 1876, the same year as the NYSBA, which was introduced by the Chair of its International Section, Thomas N. Pieper. The Conference aims to facilitate the exchange between legal professionals from Europe and the US. Close to 40 speakers and panelist shared their expertise on subjects including dispute resolution, privacy protection, and competition law, making this one of the most rewarding and interesting law events ever held at the ZHAW School of Management and Law (SML). Cases, in some of which speakers had a direct involvement, included legal disputes involving Adidas, HRS, Mastercard, Motorola, and Walmart, as well as headline-making cases like the Libor scandal or the Madoff affair. The SML would like to thank the partners who made this conference possible: The Zurich Bar Association, die Swiss-American Chamber of Commerce and the Swiss Association for Compliance and Competition. Nancy M. Thevenin introduced the concept of dispute boards. “It’s the single most effective approach for the early settlement of disputes”, she said – much faster and effective than arbitration. Cases in which dispute boards have proved invaluable include the Eurotunnel, Hong Kong Airport, and the Big Dig in Boston. Petr Koblovsky, in covering the European perspective, highlighted other positive aspects, such as confidentiality. With the recovery of the European construction sector, he expects a growing need for alternative dispute resolution. This was confirmed by German Grüniger of Implenia, Switzerland’s leading construction company. Dispute resolution is a core task of its legal department because in the construction sector disputes are often highly complex and technical. A trial can be extremely costly and may seriously affect a company’s reputation. To introduce the topic of labor law and privacy protection, Adrian von Kaenel gave the foreign guests an idea of local data law practice by raising a few issues such as the non-work-related use of corporate e-mail accounts and telephone lines, and the online vetting of job candidates. (Employers may, e.g., consult Linkedin pages, but not Facebook profiles.) Whistleblowing was another hot topic. François Berbinau pointed out the absence of a proper whistleblowing mechanism in France, where whistleblowers not only risk losing their jobs but may face criminal prosecution if their claims are interpreted as false accusations. Philip M. Berkowitz told the audience how surprised he was to learn about some of the differences between Europe and the US. In the US, the Sarbanes-Oxeley Act prohibits employers from retaliating against employees; additional protection is provided by the Dodd-Frank Act. The speaker felt that these legal provisions may in time influence company behavior around the world. He mentioned the fact that the SEC recently awarded 30 million US dollars to a foreign whistleblower, noting that the US has a tradition of applauding whistleblowers while in Europe, perhaps as a remnant from WWII, they are often regarded as denunciators. The next hot topic was introduced by Andreas Abegg, who started by describing the importance of sovereignty to Switzerland, a much-cherished right going back to the Congress of Vienna of 1814/15. John Briggs introduced the subject of extraterritoriality and declared that the US state of law is currently undergoing major changes: “We are getting from absolute to moderate chaos,” he said and added that many important actions in the US legal system were driven by private parties. This, understandably, infuriated some foreign governments, leading the Financial Times to coin the term “extraterritorial power-mongering”. While US courts regularly interfere in the domestic affairs of other countries, the speaker went on to say, he could not remember a single case where it was the other way round. John Zulack presented aspects of the Madoff case, the largest and most global fraud ever committed, with victims in 119 countries, and described the great difficulty of victims from outside the US to recover the money they had lost. 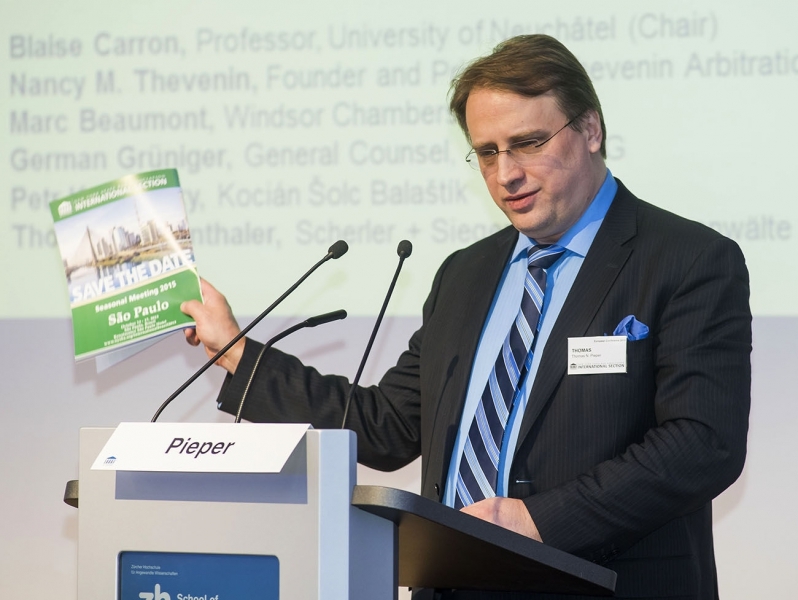 Olivier Schaller introduced the activities and duties of the Swiss Competition Commission. He described the asymmetry of information that exists between national competition commissions, which is often used by cartels to play one off against the other. Also, a lack of formalized international cooperation made the enforcement of Swiss antitrust law difficult. Next, Oliver Bretz expressed his concerns about the complexity of antitrust regulations. With regard to antitrust aspects of international financial investigations, he said: “Some regulators try to dictate terms across borders”. One had to consider the “long arm of US class actions”. To conclude, the panelists gave insightful practice tips on cross-border transactions as well as on finding suitable lawyers abroad. Organizations such as the NYSBA can provide such contacts. The buffet lunch at Theater Winterthur was accompanied by key note speeches by Nicolas von Werdt, Justice of the Swiss Supreme Court, and Marco Villiger, General Counsel of FIFA. While von Werdt elaborated on the differences between US case law and Swiss civil law, Villiger introduced his organization and talked about the difficulty of controlling 300 million direct or indirect members worldwide. The legal affairs division employs about 80 lawyers. This is partly because FIFA has to take decisions on all disputed player transfers (approx. 3,500 of 50,000 transfers a year). The heavy criticism FIFA faced during the last year has led to extensive reforms, including a new ethics committee enjoying full independency and unlimited resources. Please find here the report about the afternoon program.